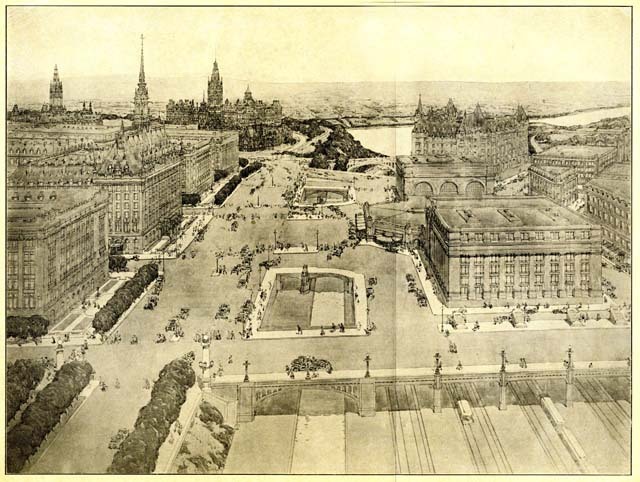 In January 1915, Sir Herbert S. Holt, Chairman of the Canadian Government's Federal Plan Commission tabled a remarkable Master Plan for Canada's Capital. The General Plan (as it was called) was not only visionary and comprehensive, It was innovative and practical. And almost immediately it was shelved and forgotten. As we celebrate the 100th anniversary of this forgotten plan,what can we learn from the General Plan's brief life and death? Why was it initiated? Who prepared the plan? Why was it abandoned? 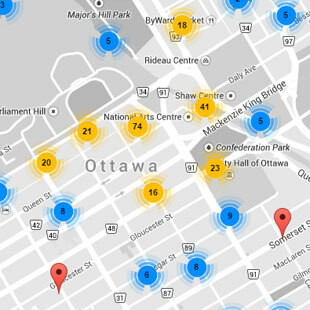 How would Ottawa have been different today, had it been fully executed? What parts of the plan were actually realized, of which we are unaware today? The Federal Plan Commission was established in 1913 by Order-In-Council of the Conservative Government led by Prime Minister Sir Robert Borden. The Commission's purpose was to “draw up and perfect” a comprehensive scheme for the future of the rapidly growing Federal Capital. It was called a General Plan. 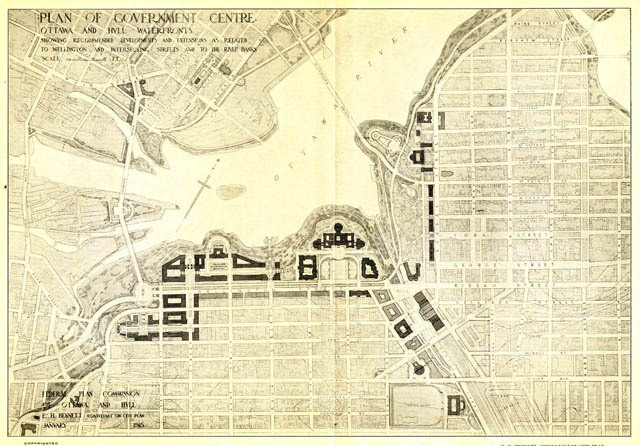 A renowned architect and urban planner from Chicago, Edward H. Bennett, was engaged to prepare the General Plan. Bennett had collaborated with Daniel Burnham on the 1909 Plan forChicago. Both were leaders in America's “City Beautiful”movement. The General Plan for Canada's Capital would be the first synoptic city plan for Ottawa and Hull. It would be one of thefirst of its type in Canada. 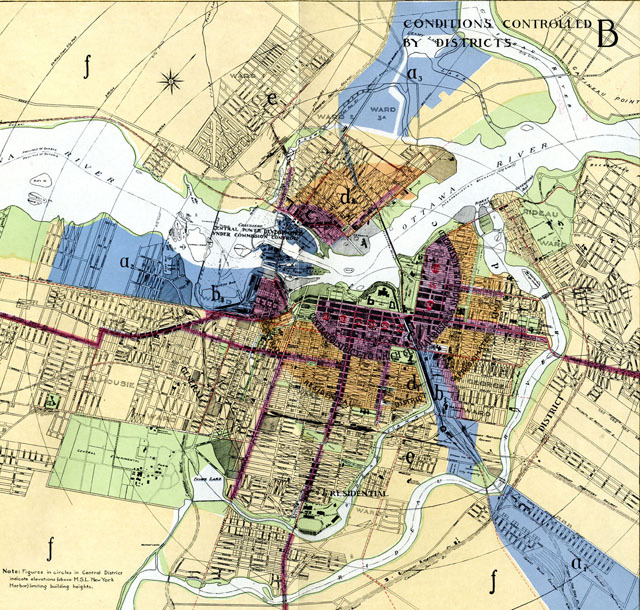 Bennett's team carefully surveyed and mapped the Capital region's existing geography, economic resources, and urban challenges. They modestly forecast that the Ottawa/Hull still arriving population of 121,300 (in 1913) would increase to 250,000 by1950, requiring a city at least twice its current the size. They were right. 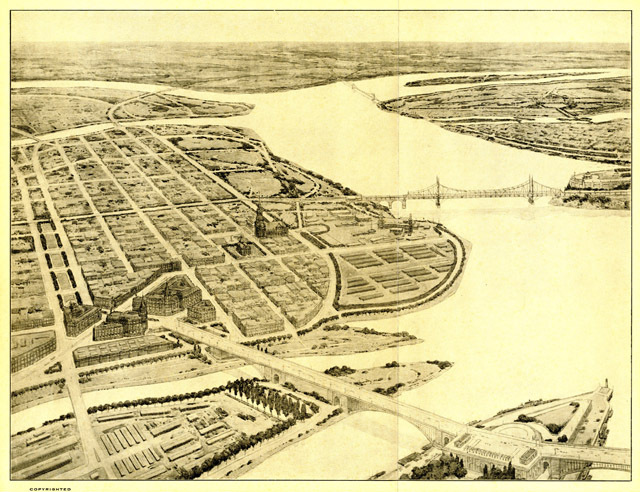 The General Plan contained a bold and inclusive vision for acity destined (in the words of former Prime Minister WilfridLaurier) to be the “Washington of the North”. Some of the plan's (ignored) recommendations would certainly have benefitted Ottawa today. Edward Bennett clearly understood the need to construct the growing Capital on a framework of excellent public transit. The General Plan recommended retaining and expanding the newly built Grand Trunk Railway Station (1912) opposite the Chateau Laurier. Had Bennett's Plan been followed, imagine arriving in the heart of Canada's Capital today by train. An unparalleled entry sequence: Union Station; a civic plaza astride the Rideau Canal dominated by Ottawa's City Hall; and inspiring views toParliament Hill. Imagine leaving Ottawa for Montreal or Toronto from this convenient hub that, even today, would offer an attractive alternative to the time consuming process of boarding your AirCanada flight from Ottawa International Airport. 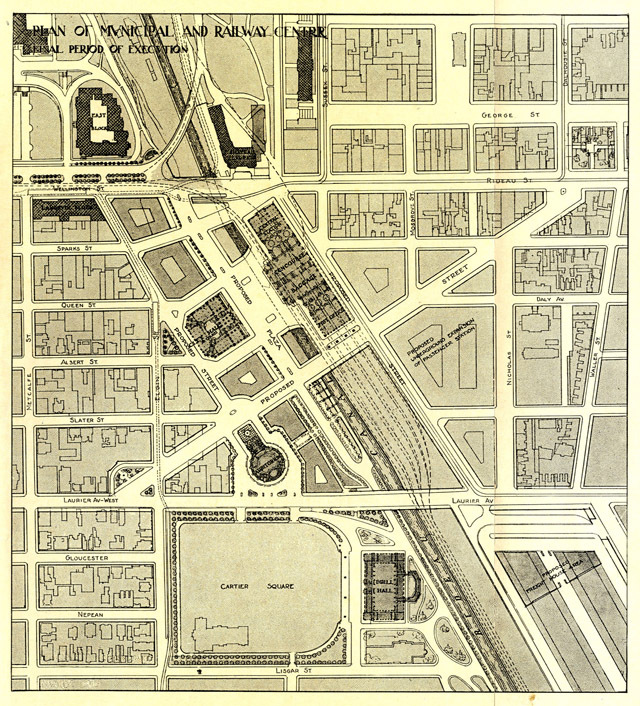 To solve the problem of the existing profligate passenger and freight railway network that disfigured Ottawa's core in 1915,Bennett recommended a dramatic reconfiguration, placing the main passenger line to Union Station in a tunnel under Wellington Street. Unfortunately, Bennett's Union Station and railway recommendations found themselves in premature retirement.All too soon, Ottawa's Central railway station was excommunicated to the suburbs – a 1950 NCC Greber Plan decision universally regretted today. Bennett also recommended fully integrating the existing urbanstreet car system with the interurban railway network. In 1915, a majority of downtown streetcar routes added to the frustrating congestion of Ottawa's streets, particularly Sparks Street (this, before the popularity of the private automobile). Bennett recommended that a streetcar subway be constructed beneath the downtown core linking LeBreton Flats and Union Station unconstrained by surface congestion. A century later, with our Confederation line LRT tunnel under construction, Ottawa is finally carrying out this Bennettproposal. Bennett's General Plan tackled the future accommodation needs of a rapidly expanding Federal bureaucracy. In 1914, Canada had just entered the “war to endall wars”. A significantly larger and diverse public service was needed to administer a vast and growing country. 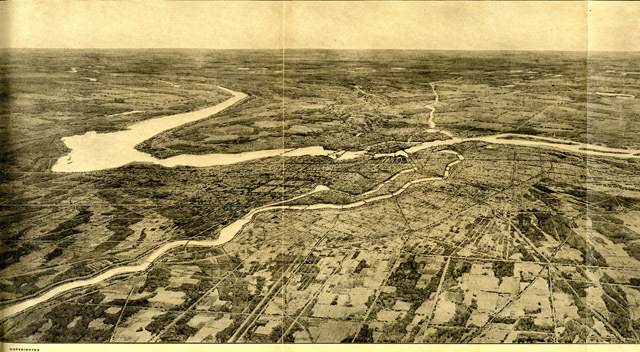 Bennett's General Plan recommended the construction of the new federal institutions along the escarpment overlooking the Ottawa River upstream and downstream of the Parliament Buildings. Noble architecture would distinguish the identity ofthe Crown from the Town. Remarkably, Bennett's legacy is recognizable today, as we travel along Wellington Street, Elgin and Sussex Drive (the NCC”s Confederation Boulevard). Recognizing the natural beauty of the “Laurentian Mountains” opposite the Parliamentary acropolis overlooking the Ottawa River, Bennett's General Plan recommended expropriating 75,000 to 100,000 acres of forest and lakes (theoriginal Gatineau Park), a proposal, generally attributed to the 1950 Greber Plan. Bennett's also plan expanded on the 1903 Todd Commission's beautification proposals for urban parkways and a linked city park system. The General Plan reviewed and endorsed contemporary engineering proposals for controlling the spring flooding in Ottawa's Rideau River urban flood plain The “City Beautiful” movement clearly held the natural environment in the greatest of respect. The Bennett Plan was comprehensive, detailed and proactive - anticipating a Capital that would soon double in size. It included specific proposals for planned suburbs, the street network, new bridges, parks and playgrounds, and zoning regulations (called district controls) to confine industry and regulate urban densities and heights. A maximum building height of 110 ft was proposed to protect the iconic skyline silhouette of Parliament Hill. This measure was quickly adopted by the City of Ottawa and survived until the mid 1960's. Some of the other principle recommendations in Bennett's General Plan may not have been so benign. The General Plan recommended extinguishing the Ottawa and Hull municipal governments. In their place, a Federal District Commission, similar to the governance model of Washington DC, was recommended. This Commission , reporting to the Government of Canada, would benevolently dictate the planning, development and operation of Canada's Capital. Imagine a city governed by the NCC with no city councillors to blame for our urban woes; or a city government that could not be ejected through democratic local elections. The utopian model of a Federal District held a surprising and enduring appeal to a succession of National Capital planners for the next 60 years, until the idea was finally retired in 1974with the Fullerton report and the creation of the Regional Municipality of Ottawa Carleton. Why was the Holt/Bennett General Plan shelved and virtually forgotten? David Gordon, Professor of Urban Planning at QueensUniversity, in his 1998 study of the Holt/Bennett Report, examines some of the “conventional explanations” for the General Plan's fate. Was the Borden government too pre-occupied with the Great War to focus on a peaceable plan for Canada's Capital? In1917 the Centre Block of Parliament burned. Was this crisis another distraction from the General Plan for the Capital? Was the plan shelved, in response to its contemporary critics, for its lack of adequate “implementation provisions” ? Or was the General Plan a victim of politics? When the Liberals defeated the Conservatives in 1921, was a Conservative Government initiated General Plan going to satisfy the new Prime Minister Mackenzie King's passion to make over Canada's Capital in his own image? In January 2015, a century since the Holt/Bennett Report was released, the General Plan deserves to be freshly examined by the public and scholars of Canada's Capital. It deserves to be remembered. For its vision and its flaws.